I'm still recovering from vacation. Still catching up on laundry and emails. Still editing photos for people who are patiently waiting. Still shipping lots of jewelry orders every day. My house needs help. I need a housekeeper. The Man doesn't think I do, so that won't happen. My kids need warm clothes. They seriously have no long sleeve shirts. Fortunately they have pants. I've just not had time to shop! So today it's: edit photos, work on jewelry orders, clean my mess of a house, or shop for clothes for my kids. They all are of equal importance. Maybe my kids should come first. That's what good moms do, right? This quote is one of my favorites and it's been on my blog sidebar for ages. It became my mantra when I was making hundreds of Blessed necklaces for Haiti, and didn't have any employees back then to help. I love it and loved seeing it up on the wall at Disneyworld. What's going on with you this humpday? I'm trying to get ready for a garage sale this weekend and a huge craft show the following weekend. Plus all the normal day to day stuff and a Hubby with strep. If you go shopping, let me know, I'll go with you. Anytime, really. This is heather btw in case it doesn't show up cuz I'm on my phone. Hi Beki. I totally know what you're talking about. We just got back from vacation (well, a week or so ago), and I'm still catching up and trying to get back into the groove of things. Can't wait to see more pictures of your vacation! 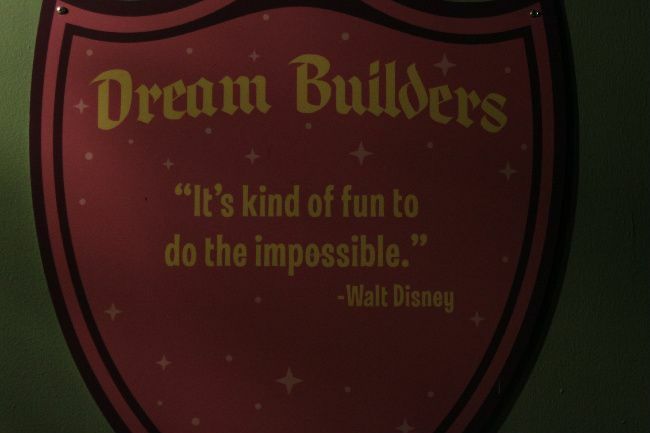 We went to Magic Kingdom last weekend and I LOVED seeing all of Walt Disney's quotes around. I wish I would have taken pictures of them. He was a smart man! Hope the rest of your week is wonderful, productive, and happy.